Word processors have gotten so good at creating rich documents that many web workers never reach for a desktop publishing package. For creating really great looking documents, though, desktop publishing can give you many types of flexibililty and precision that word processors don’t offer. For a free, very robust desktop publishing application, consider Scribus. 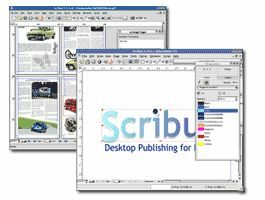 Scribus is an open source desktop publishing application, and it’s available for Windows, Mac OS X and Linux. I don’t reach for it whenever I need to produce a basic looking document, but for logos, booklets, brochures, or just very eye-popping pages I do. In Scribus, you’ll find most of the professional features you find in products such as InDesign. You get flexible PDF creation features, ICC color management and CMYK color, and more. You can get a good sense of what the application can do by touring this collection of screenshots. In true open source fashion, you can also find many useful links to add-ons and enhancements on Scribus’ site. These include printing enhancement tools, color management extras, and more. There are quite a few publishing houses that rely on Scribus, such as Urco Editora. You can find more on this application, and several other open source tools for creating documents in today’s post on OStatic. Do you use desktop publishing tools? Can Scribus allow the user to produce a tabloid-size school newspaper? And is it fairly easy to use? A bit of a steep learning curve. By far this produces outstanding PDF’s. Thanks for the headsup, I needed an app to get me going with some business cards and InDesign seems a little over priced for one job. Will give this a trial today. Ta! Works fine for me on Windows XP.